I've really enjoyed hearing about Percy and his antics. We used to have a rabbit that would trash his cage when ignored too, and who was as big as Percy but with loppy ears. Maybe he has half-normal, half-loppy genes? A neighbour of ours also used to have a house rabbit that would come when whistled, and sit on his owners foot patiently until he finished conversations. Other than that he behaved like a cat. I don't think he was quite so indulged as Percy, though, who seems to be thriving on it! Love the ice bottles idea. Our chickens used to paddle in the burn when the got too hot - you could almost see the cartoon steam being released. But temperatures over 100 are not something we need to worry about much here. Maybe hot water bottles would be more in order. I forgot to mention the lifting. We were told to hold their ears together at the base and put a hand under their bottom and lift from there (no weight on the ears). I think the ears thing might just subdue them. Worked on ours but they were much smaller and less wilfull. I must admit picking Percy up is the only issue we have with him, we stroke him until he is in what we call his "settled submissive mode" then just scoop him up holding him against my chest with one hand on his back the other supporting his rear. When we check him over or groom his feet we place him in a towel so he cannot struggle, this he now accepts. I will try out the tip with the ears so thanks for that. At present with the snow he comes in covered with mud and wet from digging through it to find our herbs to eat so he is getting a rub down and clean several times a day, it is funny watching him chase our dogs through the snow. He has also taken to following Max out and standing next to him when Max does his "I live here so be warned" guard dog barking thing, really funny to see. I never realized rabbits had such characters. 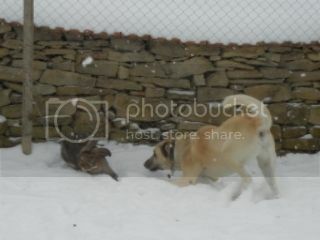 Fun in the snow, best friends having a play this morning! Percy sounds a great character. Love the ears. Just beware of chewing! My son had a house rabbit many years ago and they came to stay one weekend. Austin chewed through several pairs of shoes and then somehow found OH's leather camera bag which now has several chewed holes in it and OH has never forgiven him! Bluefinch wrote: Percy sounds a great character. Love the ears. Just beware of chewing! He is a character, a right bad tempered one as well!! Today he refused to go outside whilst we did the morning clean up, I presume, because it was too cold for him so we ushered him into his crate so we could mop etc. On releasing the beast he took to sulking but ensured we knew he was unhappy by picking up his food dish and throwing it out of the cage, bran everywhere! Next going to his litter tray and dragging that across the floor before upending it! Then to cap it off he grabbed the large water bowl he shares with the dogs and decided to throw that about, water everywhere so the mops were out again! As for chewing we also learnt the hard way, light cables sheared, my headphones lead sheared, laptop lead sheared, anything in his way is moved first by a gentle nudge but if that does not work he takes to grabbing it in his mouth before throwing it. I soon learnt my guitar and stand were not safe when he was around often seeing it being nudged and moved out of his way. But for all that I never knew rabbits could be so amusing and friendly, funny creatures really. Oh dear! I suppose you have to concentrate on his good bits and laugh at the rest. Percy is spectacular! 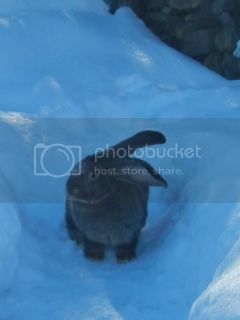 Love the picture of him in between the frozen bottles, I also do this with my bunnies. I have three - Bella the slightly stroppy (I think stroppy is a rabbit thing!) English x lionhead house bunny and Dennis and Betty who are a Dutch brother and sister pair living in the garden. All three look tiny compared to Percy though. Do you forage for Percy? I went on a foraging for rabbits course a couple of years ago and can't wait for spring so I can start collecting food for them again. Does he eat your plants? Mine were decimated last summer, I need to fence everything off and grow stuff in the front garden this year so the bunnies can still free range. Garden_Witch wrote: Do you forage for Percy? I went on a foraging for rabbits course a couple of years ago and can't wait for spring so I can start collecting food for them again. Does he eat your plants? Mine were decimated last summer, I need to fence everything off and grow stuff in the front garden this year so the bunnies can still free range. We do a lot of foraging for ourselves and he reaps the benefits! Wild strawberries & leaves, blackcurrants & leaves, dandelions, apples and the branches which he loves to chew on (we have several laying around so he chews them and hopefully not anything else! 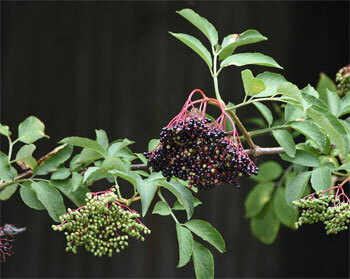 ), wild cherries, wild mint, nettles, comfrey and yarrow are a few we collect. We also cut the grass out in the hills/mountains behind us and dry it for hay (all the locals do the same) so he has that for bedding and the bulk of his diet. In the garden he obviously loves the clover and between himself and the chickens they totally destroyed our "experimental" herb garden last year and "helped" dig up the potatoes (earlier than we wanted! ), luckily most of our vegetables etc are grown in a segregated area so they are safe but like yourself we will be putting up a few barriers this year as well building him a play area out of old car tyres and logs. Any other plants you forage for I would be interested to know about and I will look out for them here. Some favourites recommended to me by the bunny foraging queen Twigs Way ( she has a book on the subject) are hawthorn (really plentiful here and they love it), willow and rosebay willowherb, cleavers, blackberries and cow parsley ( just watch you don't pick anything poisonous as a few nasties look like cow parsley). My lot also love wild rose stalks and leaves but I only pick these occasionally where there's a large patch near me as they are a bit less common. And wild geraniums....I keep thinking of more! https://shop.rabbitwelfare.co.uk/produc ... twigs-way/" onclick="window.open(this.href);return false;"
Thanks for the info and link to the book We have a lot of wild roses growing out here so will try him on some stalks when the snow has gone. He would thank you himself but he is too lazy to get of the settee and come to the keyboard! Before we got Percy we were both under the mistaken impression that rabbits were lovable furry creatures that were friendly, quiet and never caused any problems...well......we were wrong, never have we been so wrong, either that or we just had the misfortune to pick the only rabbit that does not meet this expected criteria!! Today Percy threw a strop when I brought him in to go for a run earlier, yes, you read that correctly, he threw a right strop just like a kid throwing a tantrum. After getting him out of the chicken area I nudged him along only to be rewarded with a stream of urine as he scarpered away from me in the totally opposite direction of the house, lovely eventually I steered him to the door only then he refused to go through it collapsing down and not budging So I had to pick him up (and he is some weight now) then carry him inside, once down he picked up the water bowl and threw it then proceeded to drag his litter trays out and up end them before peeing on the floor (something he has not done since being given the freedom of the house) and running off into his cage and burying himself under the hay where he stayed up until a few minutes ago. Now he normally leaves his cage then goes and says hello to everyone before settling on the sofa, tonight he has gone to see both of the dogs and totally ignored us and is now sulking under the table. Certainly has some attitude that rabbit, really bad attitude!! PS We love him to bits though!! He sounds adorable - what a character!!! Trev62 wrote: Before we got Percy we were both under the mistaken impression that rabbits were lovable furry creatures that were friendly, quiet and never caused any problems...well......we were wrong, never have we been so wrong, either that or we just had the misfortune to pick the only rabbit that does not meet this expected criteria! !